Surgeon General’s Warning: This post contains light bragging proceed proread at your own risk. The Mecca for Makers, and a highlight of every May, is the Maker Faire at the San Mateo Convention Center. I love the tinkerer energy, the eclectic exhibitions of blinking lights, bicycle powered music, and the opportunity to try things out and geek out around all kinds of interests. One outdoor exhibition has lots of spectators almost all of the time. I guess it is special not only for me and my (back then) 8 year old daughter Nina. She was under the weather a bit last year, not the best state to enjoy Maker Faire. Thus, we were looking for the exit relatively early in the afternoon. Just when we realized that the exit is at the other end of the Fairground, Nina saw the Whiskeydrome again. She came back to life and asked, with a shimmer of wonder in her eyes, whether we could check it out one last time. Of course we can! 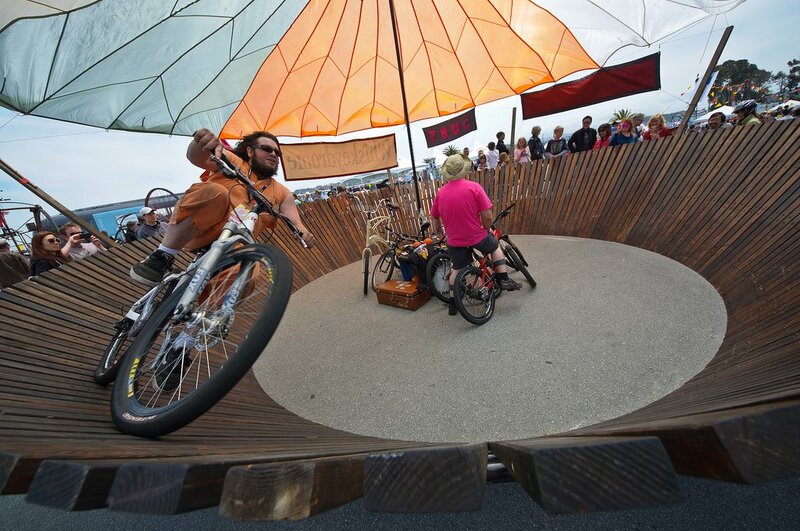 She ran to the contraption that looks a lot like a monster-cut-off-and-splayed-whiskey-barrel to watch the daredevil bikers go round and round. If you are brave, you can go try it too. You sign a waver, wait your turn, and under the watchful eye of all the spectators, you may ride around the steep wall — or you don’t. I was tempted the year before but chickened out. “Too many people in line, it will take too long,” my fearful brain told me. Same earlier in the day, I just could not do it. Now, to my great surprise, there was almost no one in line. No more excuses. I signed the waver, I got a t-shirt as a memento, and I climbed up the stairs to join the fun. My heart started pounding. Standing up on the ladder, I had to wait my turn to get in. Nina was standing on the opposite side of Whiskeydrome. When she saw me climbing it, her eyes got wide; her jaw dropped; and she started to wave her arms, shaking her head, and clearly voicing big fat NNNOOO NOO NOOs with her mouth. That didn’t make it any easier to me; my nerves started to flutter. Focus, focus, focus. I had carefully studied how the others do it. My conclusion was: Pedal like crazy while still on the ground to get enough speed and then swiftly transition up the wall. The guy in front of me tried and failed miserably. 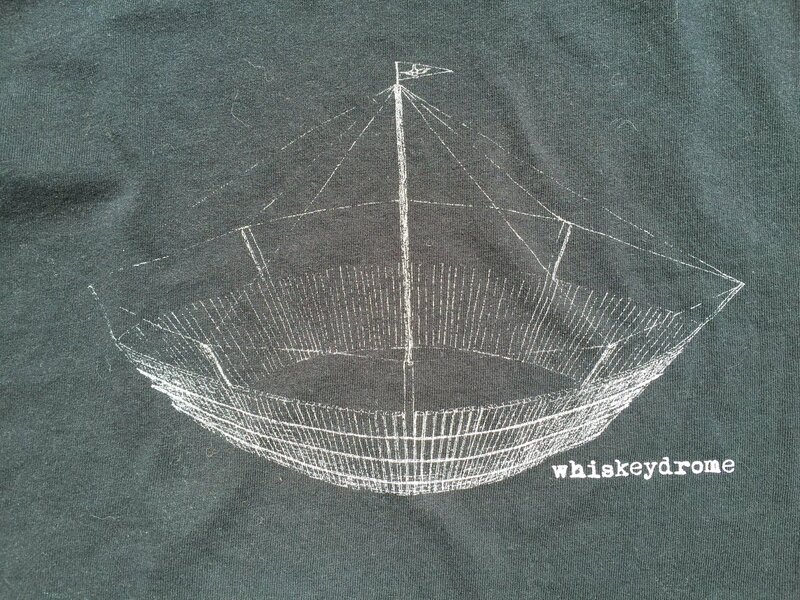 He climbed out of the Whiskeydrome with his head tucked under his arm. Not a confidence booster either. I was up next. They gave me this heavy cruiser bike. It was a monster to get going but very stable. The circle on the ground is a lot smaller than I had imagined. Let’s just say, it was a wobbly start. I pushed and pushed, then I put the front wheel on the wood. But I thought better of it, and brought it back down to gather some more speed. With a little jerk of the handlebar I brought the front wheel up again and the back wheel followed. But the bike immediately went really high, which took a lot of my speed. I lost momentum. Hastily, I adjusted to the middle of the wooden round, pushing some more. The bike and I stabilized. 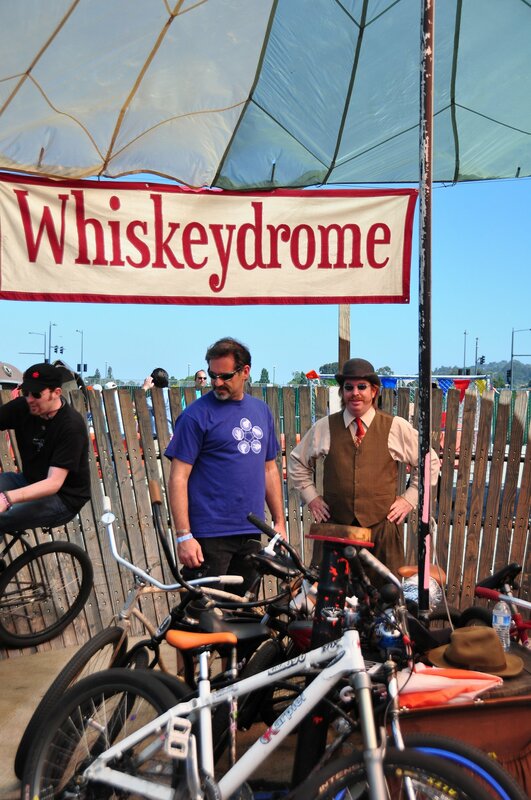 Not that I was whizzing around the Whiskeydrome, but I was riding more and more comfortably. Well, not comfortable enough to make out Nina’s face in the crowd of spectators, but enough to really enjoy the ride. 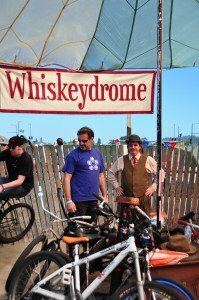 I had given my phone to one of the Whiskeydrome guys in the middle, and he took this little video. Oh how proud I was when I climbed out. It made me a little less fearful regarding life’s twists and turns. Step up, put yourself in the ring even (or especially) if failure and humiliation is just a small step away. Join the Maker Faire this weekend 16/17th of May at the San Mateo Convention Center. There is so much to discover and do. Nina just told me, “you have to go in the ‘bullring’ again.” I am not so sure yet. See you there!